Many university chemistry departments, and mine is no exception, like to invite applicants to our courses to show them around. Part of the activities on the day is an “interview” in which the candidate is given a chance to shine. Over the years, I have evolved questions about chemistry which can form the basis of discussion, and I thought I would share one such question here. It starts by my drawing on the blackboard (yes, I really still use one!) 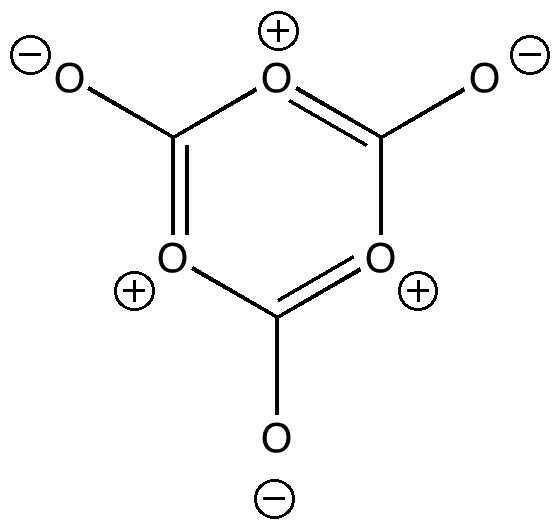 the following molecular structure. The candidate is then invited to offer their initial impressions of this molecule, and shortly thereafter asked how they might make it (or where perhaps they might be able to buy it). This of course floors even the most confident of applicants! But after a moments thought, most students can derive not only a molecular formula, but an empirical formula. From which it becomes apparent that it is actually a trimer of carbon dioxide. In the previous post, I showed the structure of solid CO2 and how an oxygen from one unit came fairly close to a carbon from another. So the next logical question might be to ask if this might lead to a molecule such as shown above. Why a trimer? Well, the aromatic core is also easily perceived, and one might expect some aromatic stabilization to result (which most of the candidates readily spot). Its also ionic, and here perhaps solvation may help stabilize. Finally, armed with Le Chatelier’s principle, one might conclude that pressure too would help. At this point of course, the realization normally dawns that possibly the purchase of a carbonated soft drink in a supermarket might offer perhaps a few molecules of the above. The discussion normally takes about 10 minutes, and is guaranteed to stimulate (and quite possibly exhaust) most students. The trimer energy evaluated in a continuum solvent (water). This works out at 83.4 kcal/mol higher than three monomers (in part due to the entropic requirements of coalescing three molecules into one). So, not many molecules in a fizzy drink then! (just as well perhaps, since e.g. benzene as an aromatic molecule would not be a pleasant additive). How aromatic is the molecule? Well, a NICS(1) index of -2.3 ppm suggests little actual aromaticity. The C-O bond length (1.365Å) is certainly short enough. The Kekulé vibrational mode however is quite low (974 cm-1) compared to benzene, which is ~1310 cm-1 (remember, this mode represents how much energy it takes to distort an aromatic ring from a symmetric structure to the bond localized form). It is worth asking why even this perfectly reasonable form is so much higher in free energy than carbon dioxide itself. 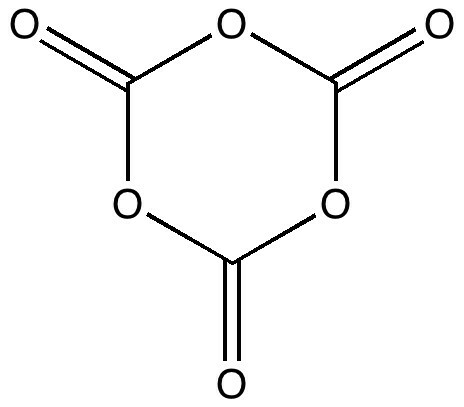 Would solvating the structure with three explicit water molecules help (as per below)? Deciding quite how the hydrogen bonds will form is an interesting exercise in its own right! But now the energy is +96.8 kcal/mol compared to the monomers. Its that entropy again! Actually, oxygen is pretty poor at propagating aromaticity. 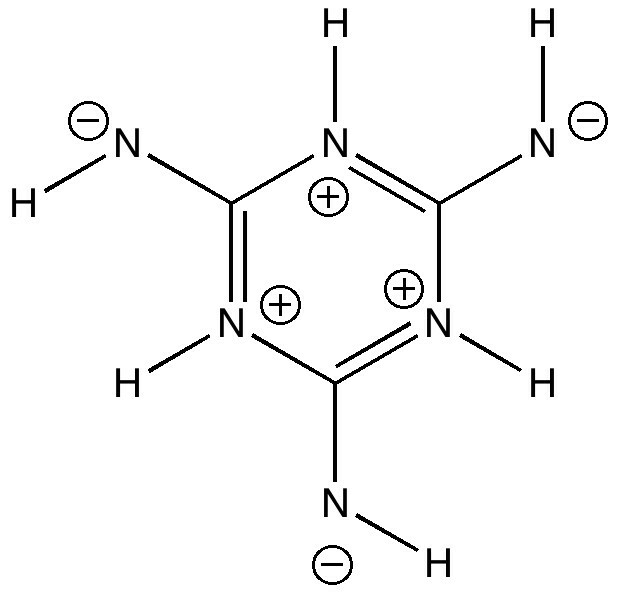 Nitrogen is much better, so what about the following (historically, such s-triazines were in fact much better known than benzene itself in the first half of the 19th century). This is now merely +35.8 kcal/mol higher in free energy compared to three momers. The Kekulé mode is up to 1355 cm-1 (discuss!). There are many other facets of this that could be raised. But the main reason for introducing such a molecule for discussion is that just by looking at the structure, so many ideas can be explored. That, by and large, is how chemistry works. This entry was posted on Sunday, September 19th, 2010 at 11:23 am and is filed under Interesting chemistry. You can follow any responses to this entry through the RSS 2.0 feed. You can leave a response, or trackback from your own site. An interesting blog. On seeing your “strange” molecule my first thought was to rearrange it into the other resonance form I subsequently found you had briefly discussed later in the blog. I could (and indeed cannot in my very simplistic approach) see any reason why this species cannot exist. So, I did some CSD searches. 1) No examples of C3O6. I think we already knew this, but I checked without specifying the nature of the bonds or that there could not be anything else. 2) 27 examples of the central C3O3 ring (again bond type not specified). 17 with chair form, 1 with boat, 7 with no coordinates, and 2 disordered. One of the disordered ones had looked interesting from the diagram, being depicted as having three C=O double bonds and three C-O single bonds, but closer inspection showed it have high symmetry disorder, and thus the bond ordering is entirely fictional; it might be true, but there are no good reasons to think that it is true. 3) Zero examples of a C3O3 ring with an oxygen bound to one of the carbons. To me this is the most interesting finding. Is a CH2OCH2OCH(OR)O ring energetically impossible? In terms of what could plausibly be “clipped together” it seems entirely reasonable to me. Of course, synthesising derivates of 1,3,5-trioxane (as I now know (CH2O)3 is called) is not helped by its tendency to fall apart into formaldehyde (H2C=O) in acidic solution. Just as your initial molecule can be seen as a trimer of carbon dioxide, so 1,3,5-trioxane is a trimer of formaldehyde. So, is this an entropy issue again? P.S. It may seem silly to give the formula of formaldehyde, but I spend my time dealing with molecules visually and not “textually” so I often find myself having to look up the names of simple species to remind myself what they are.